These DOF glasses offer a wry play on how optimists and pessimists view the same glass. Serve your next drinks with a shot of wry humor. 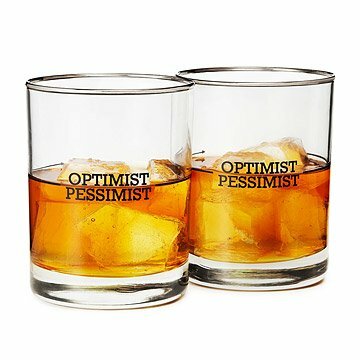 Offering a play on how optimists and pessimists view the same glass—half full or half empty—these handsome, double old fashioned glasses mark that dividing line. Hand-painted platinum rims ensure every sip has a silver lining... regardless of the drinker's outlook. Comes in a set of two glasses, perfect for giving or as a new addition to your home bar. Glasses made in the USA. Decorated in Lawrence, Kansas. Purchased this as one of his gifts for 20th anniversary because of the platinum rim. Also, one of us tends to have a half full pov and the other, half empty pov, so it was just a cute set for him/us. Good quality glasses. Love these glasses - simple, funny. Great gift. Using for entertaining AND every day. The glasses seem very sturdy, but not ridiculously heavy. They aren't dishwasher safe, but I'm assuming that might make the writing on them chip off, so I am ok with that. Works well with the large round whiskey ice balls sold on this site. I loved that it went very well with how my bro thinks!